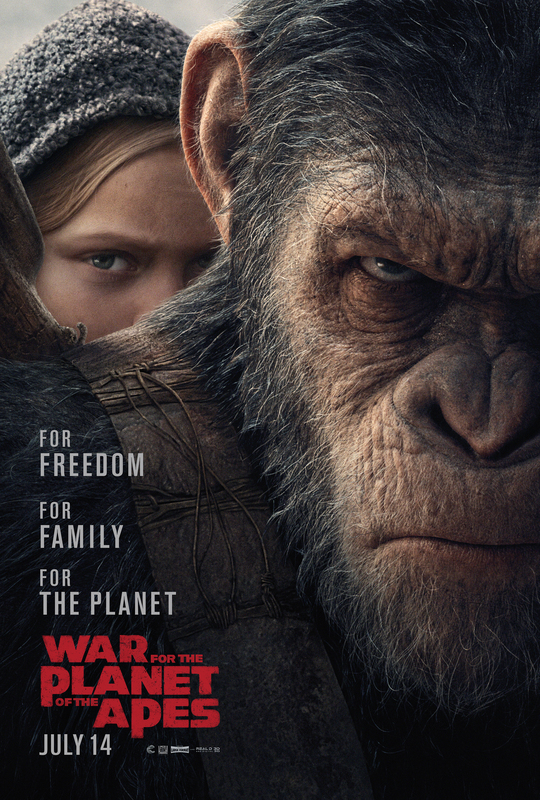 The reboot of the Planet of the Apes franchise has gone from SciFi action thriller to the current iteration.. WAR FOR THE PLANET OF THE APES is a deeply thoughtful and thought provoking movie. When Matt Reeves took the director’s chair from Rupert Wyatt he steered the franchise in a slightly different direction. Rather than focus on how humanity tries to save itself, DAWN OF THE PLANET OF THE APES turned the lens on the apes, how Caesar would lead them as they searched for a safe place in their world. WAR tacks in the same direction, but ramps up the consequences. Humans, led by Woody Harrelson’s “Colonel” are still trying to wipe out the colony of apes lead by Caesar. After a nighttime raid by the soldiers, it gets personal for Caesar after he experiences a horrific loss. His mission changes from one of survival to one of revenge. Maurice even points out that he has become “Koba”, the ape from DAWN whose attack motivated the Colonel’s own revenge fantasy. Caesar is struggling with his humanity. Is vengeance more important than survival? These are the big ticket questions the movie deals with. While following the soldiers to a northern border outpost Caesar, Maurice, Rocket and Luca come across a young girl who is unable to speak. Maurice cannot leave her behind, so she joins the mission. Then when they get to the outpost Caesar is captured after and ill-advised attack in a fit of rage. What follows is the Ape version of “Bridge on the River Kwai”. The apes are forced to build a wall for The Colonel. Caesar is kept in solitary confinement. It’s a battle for escape and the moral high ground. The Colonel has logical, but completely insane reasons for wanting his wall. In the end Caesar finds truth and salvation. He also discovers mercy is better than revenge. Take the apes out of the equation and this would be a movie for everyone. Heck, it should be a movie for everyone. Some may dismiss it as just another SciFi summer tentpole because it includes motion captured, sentient apes. But this is a fine example of how SciFi can be used to tell human stories and deliver a poignant message. I loved WAR FOR THE PLANET OF THE APES. It is one of the best films I have seen this year.